Sóller is situated in a valley on the northwest coast of Mallorcas only mountain range: „Sierra de Tramuntana“ ,pretty much 30km north of the Balearic capital Palma de Mallorca. 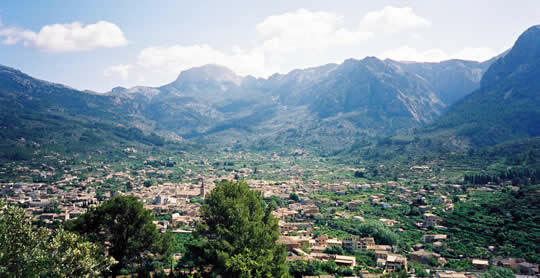 The Valley of Sóller is surrounded by some of Mallorcas highest summits: Puig Major (with 1445m Mallorcas highest summit), Puig de L´Ofre (1090m), Sierra de Alfabia ( untill roughly 1000m) and Es Teix (1050m). 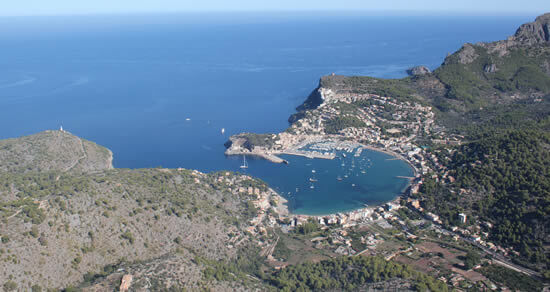 Being a part of the township of Sóller there are the „Town-Gardens“ such as s´Horta (la Huerta), the tiny village of Biniaraix, submontane to the Sierra de Alfabia as well as the habour es Port (el Puerto). Sóllers city center is approximately 3km away from the habour and the sea. 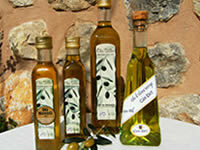 The neighbouring villages wich do not belong to Sóller anymore are worth a visit as well. Fornalutx, located in the same valley but a little further up in direction towards the Monastery Lluch and Pollenca, has been voted for and won the title of Spains most beautiful village twice, because of its fondly well kept allyways and „patios“. Deià, imbedded in the slopes of a little valley submontane of es Teix in the midst of a cliffline and facing towards the sea, has atracted many famous people ever since. Archduke Ludwig Salvator for example bought wide zones around the „Artists-Village“ at the end of the 18th Century. The splendidly constructed main road C711 connects Sóller directly with the capital Palma de Mallorca. Since 1995 there´s the posibility of avoiding the winding mountain pass „ Coll de Sóller“, by using the 3,14km long tunnel with a road charge of 4,25€ one way for a normal car. The pretty narrow and curvacious C710 goes from Valldemossa/Deià past Sóller in direction towards Fornalutx, Monastery Lluch and Pollenca. This road leads you consistently through awe-inspiring landscapes and is always worth a trip. The very lovely „Tramvia“ connects Sóllers city center with the harbour, and needs about 20 minutes.